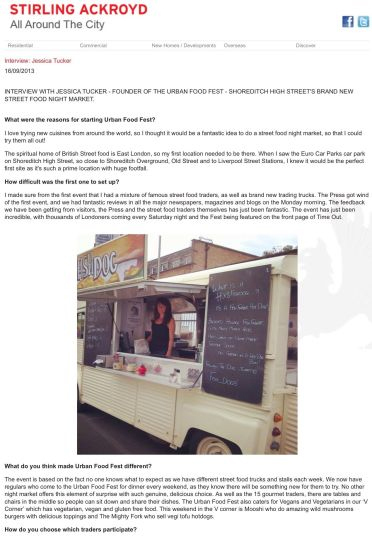 What were the reasons for starting Urban Food Fest? I love trying new cuisines from around the world, so I thought it would be a fantastic idea to do a street food night market, so that I could try them all out! The spiritual home of British Street food is East London, so my first location needed to be there. When I saw the Euro Car Parks car park on Shoreditch High Street, so close to Shoreditch Overground, Old Street and to Liverpool Street Stations, I knew it would be the perfect first site as it’s such a prime location with huge footfall. How difficult was the first one to set up? The Press got wind of the first event, and we had fantastic reviews in all the major newspapers, magazines and blogs on the Monday morning. The feedback we have been getting from visitors, the Press and the street food traders themselves has just been fantastic. The event has just been incredible, with thousands of Londoners coming every Saturday night and the Fest being featured on the front page of Time Out. How do you choose which traders participate? The first test is obviously taste. Each and every dish needs to be first class, restaurant quality mouth-watering food. After all we are called the Urban Food Fest! Secondly it’s aesthetics. 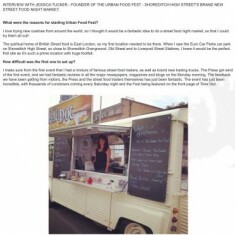 Each truck and stall needs to be fun, creative and fit perfectly into the quirky Shoreditch look. Based on food some of my favourites are the Argentinian ricotta empanadas – simply divine – and frogs legs, as well as the chocolate chip giant cookies. Based on looks I love the monster pizza truck’s hand painted monster design, which was created by Shoreditch based artists, and comes with a mini green monster which sits outside. Street food was originally intended to be cheap, when it becomes restaurant quality do the costs go up? I check that all the dishes are very cheap and value for money. The cheapest is £1 but the most expensive is probably a gourmet chorizo pizza at £7, but all the portions are huge. It’s never at restaurant prices, and the drinks are always cheaper than the local bars. We do every kind of alcoholic drink you could ever want. We do regular beers and craft beers, cider from niche breweries, wines from Italy, prosecco from France, as well as our own unique cocktails such as Elderflower and raspberry and much more. Street food is not just about the food, but also about the traders, their personalities and the stories behind their trucks. They all have a genuine passion for their food. Tell me about your plans for the Oktoberfest themed event on the 28th September? I’ve always been a huge fan of the world famous Munich beer festival, the Oktoberfest, so I thought it would be a lot of fun to do an Urban Food Oktoberfest. We will all be wearing dirndls and lederhosen and there will be German and Austrian food stalls serving schnitzels with sussersenf, German pork dumplings and kaspressknoedel followed by apfel strudel. As well as crispy Frankfurter sausages with sauerkraut and beef goulash with red cabbage slaw; and juicy vegetarian tofu German hotdogs. For dessert there are Bavarian cakes such as chocolate sacher torte and macarons, such a kirsch and German chocolate; and Bavarian inspired marshmallows. Of course no Oktoberfest is complete without ice cold German beer. There will also be Oktoberfest style benches, traditional music and much more. We want all our Fest goers to get into the spirit of the event and come in costumes. There is a prize of a giant bottle of champagne for the coolest one.